A Wearable Women Want to Wear? 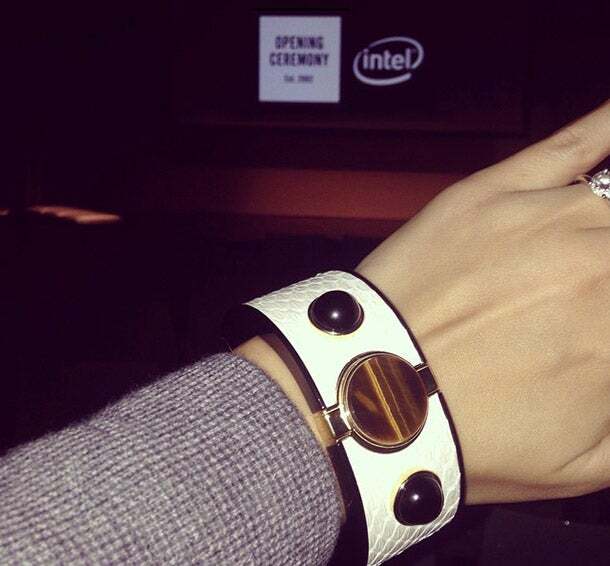 Behind Intel's New Smart Bracelet. Image credit: Collier Schorr for Opening Ceremony and Intel. There’s wearable tech and then there’s fashionable tech. But how can a smart device be “wantable” enough to become a fashion-conscious woman's next must-have accessory? To answer that question, Intel began 2014 with the goal to create a smart bracelet that was high-tech as it was high-fashion. The result? MICA (My Intelligent Communication Acessory), unveiled this week by the Silicon Valley-based chipmaker. Ayse Ildeniz, vice president of New Devices Group at Intel, says that usually the process of developing a wearable device in-house takes 18 months to two years, so the strict holiday shopping deadline required extra manpower and R&D. Intel’s devices team acknowledged that it would need the insights of fashion industry experts. Luxury retailer Barney’s (an exclusive retail partner for the MICA cuff) and the Council of Fashion Designers of America recommended Opening Ceremony as a creative partner because of its modern and multinational approach to design, according to Carol Lim, co-founder of the New York-based global retailer and fashion brand. “Intel wanted input from the very beginning stage. It wasn’t just ‘here you go, decorate this tech bracelet,'” she adds. The end-product screams David Yurman or Roberto Coin more than Fitbit or Pebble. Opening Ceremony's finishing touches on the MICA bangle include 18 karat gold coating and solid snake skin, as well as exotic accents like obsidian from Russia and lapis from Madagascar. The bracelet's interior features a sapphire-glass screen displaying Gmail, Google Calendar, and Facebook notifications. Through a partnership with TomTom, women wearing the cuff can receive alerts when it’s time to leave for the next appointment, based on the user’s current location. MICA’s features reveals how even a behemoth like Intel (founded in 1968 with a market cap of $164.5 billion) can gain fresh perspective through partnerships from a range of fields. Intel's team had to let Opening Ceremony (a retail brand founded in 2002) take the lead for the sake of style. Lim says it’s easy to dream up an incredibly sleek accessory and jam-pack it with every functionality. But both sides learned that they couldn't get carried away in order to achieve the right balance among tech, fashion and luxury. First, they had to have a clear perspective of what the MICA wouldn’t be. “We knew it wasn’t going to replace their phone or take pictures,” Lim says. The company chose to focus on keeping women connected to the closest people in their lives, a desire that surfaced during market research. To this end, Intel and Opening Ceremony added a “VIP texts” feature. The curated contact list allows users to choose up to 10 VIPs to whom they could send customizable quick replies directly from the wrist – eliminating the need to fumble through a handbag or interrupt a dinner meeting. Will You Record Your Snaps With Snapchat Spectacles?